Episode #296 Part V: MegaCon 2014: Kickstarter Panel! Download Episode 296 Part V! This was the final panel I attended Sunday, and my final panel for MegaCon 2014. It started around 1:45 p.m., at the same time the AGES OF HEROES ERAS OF MEN panel was ending, so I joined the Kickstarter panel already in progress. The panelists were Jimmy Palmiotti, Frank Tieri and Nelson DeCastro. They answered questions from the audience and shared their experiences with Kickstarter projects to give advice on the do's and don'ts of doing a Kickstarter project. Next Episode: MEGACON 2014 WRAP UP & INTERVIEWS! Episode #296 Part IV: MegaCon 2014: The Capes, Cowls And Culture: Ages Of Heroes, Eras of Men Panel! (L to R) Julian Chambliss, William Svitavsky and Thomas Donaldson. Download Episode 296 Part IV! This panel was the first one I attended at MegaCon on Sunday, March 23, 2014, around 1:00 p.m. 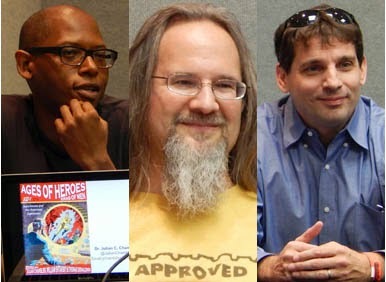 The panelists, Julian Chambliss, William Svitavsky and Thomas Donaldson, discuss the book they edited, AGES OF HEROES, ERAS OF MEN, published by Cambridge Scholars Publishing, and also available at Amazon, Blackwell and Ingram. The panelists, all comic book readers themselves, put together an anthology of essays by scholars in many fields, exploring the changing depictions of superheroes divided into three eras: Golden Age, Silver Age and Modern. In a discussion with the audience, they shared how the current culture of the time influenced the evolving superhero. Episode #296 Part III: MegaCon 2014: Break-In Stories! (L to R) Russell Lissau, Frank Tieri, Mike Miller, Steve Horton and panel moderator Roland Mann. This was the third and final panel I attended at MegaCon on Saturday, March 22, 2014. It was not a how-to on breaking in to comic book stores or comic book publisher offices, but rather an informative panel of five comic book professionals sharing their stories on how they broke in to the industry and began their careers. During the discussion, they shared tips on how to's and not do's for others to get their break in the comic book industry. Next Episode: MEGACON 2014 PART IV: CAPES, COWLS AND CULTURE: AGES OF HEROES, ERAS OF MEN EXPLORES COMICS CULTURE PANEL! Episode #296 Part II: MegaCon 2014: Spotlight On Bill Sienkiewicz Panel! (L to R) J. David Spurlock and Bill Sienkiewicz. Download Episode 296 Part II! The second panel I attended at the 2014 MegaCon was the SPOTLIGHT IN BILL SIENKIEWICZ PANEL, which occurred on Saturday, March 22, 2014. J. David Spurlock, writer, comic book agent and publisher of Vanguard Productions served as moderator. Vanguard Productions produces art books on various comic book artists. This panel served as a discussion of Bill Sienkiewicz's career, his artistic influences and evolution of his art style. J. David Spurlock and Bill Sienkiewicz worked together on TALES FROM THE EDGE, a comic book anthology available from Vanguard Productions. After this panel is an interview with J. David Spurlock about his career as a comic book writer, agent and publisher. The Bill Sienkiewicz panel is © J. David Spurlock and Bill Sienkiewicz. All rights reserved. Next Episode: MEGACON 2014 PART III: BREAK-IN STORIES! Episode #296 Part I: MegaCon 2014: The Kubert School Panel! Download Episode 296 Part I! This panel was the first one I attended at the 2014 MegaCon. It began at 2:30 p.m. on Saturday, March 22, 2014. Adam Kubert led the panel, showing a video about the school, then discussing how the Kubert school prepares students for not only a comic book career, but other graphic art jobs as well. He also answered questions from the audience. The Kubert School Of Cartoon And Graphic Art website has all of the details you will require to learn how to apply to the school, which is fully accredited and accepts all forms of financial aid. The video Adam shared at the MegaCon can be viewed on the school's website. Correspondence Courses are available, as well as art supplies. Next Episode: MEGACON 2014 PART II: THE SPOTLIGHT ON BILL SIENKIEWICZ PANEL! Episode #296: MegaCon 2014 Preview! No, you haven't missed an episode. Preparing to cover seven stories in SUPERMAN ANNUAL 6 took longer than expected, and home life used up some more spare time, so we will jump back through the time barrier after my MegaCon coverage and finish up the Superman titles cover dated January 1963, and resume our regular schedule through the time barrier. In this episode, I highlight the convention guests and panels I plan on seeing, including those I had to miss on Friday because my car was in the repair shop until the early afternoon that day. Next Episode: MEGACON 2014 PART I: THE KUBERT SCHOOL PANEL!